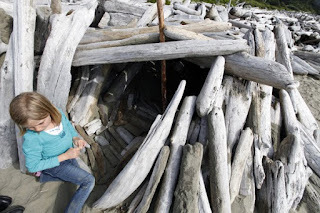 Mira Terra Travel Blog: How Cool is Ucluelet? 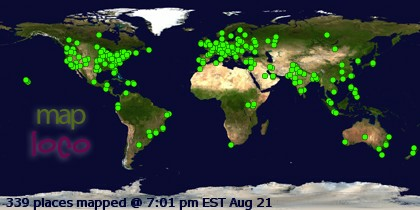 And what/where is Ucluelet, anyway? 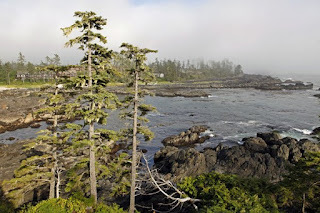 Ucluelet is this cool little town on the west coast of Vancouver Island, British Columbia, Canada. Cool because it sits on the foggy coast of the Pacific. Cool because it is surrounded on either side by the Pacific Rim National Park. Cool because the Canadian locals are friendly and easy-going. And cool because, amongst other activities, there's surf! We arrived by car from Victoria, a long 5-6 hour drive through fantastic scenery, but such harrowing roads that it quickly earned a place on my list of "never again" travel experiences. Never again, that is, until we had to leave the same way we came. But I'll get to that later. The Pacific coast of Vancouver Island is known to be a storm-watcher's paradise. Winter is the best season for storm-watching, but any time of year one can appreciate the ocean's dramatic meeting with the land on this rugged and wild coast. For surfers, they've probably heard of Tofino, which is up the road about 40 minutes drive from Ucluelet. 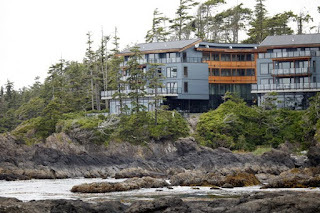 We had every intention of checking it out, but found that Ucluelet offered everything we could need or want for a surf safari, wildlife safari, ocean safari, great dining options, and great lodging...less the crowds of visitors to Tofino. As a "Native of Paradise" (born in Coronado, California), there are few places in the world I would considering moving to, if I absolutely had to. 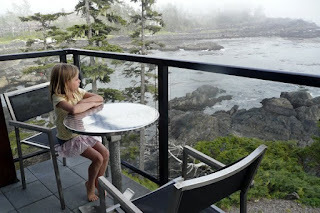 I could live in Ucluelet, quite happily. That says alot. 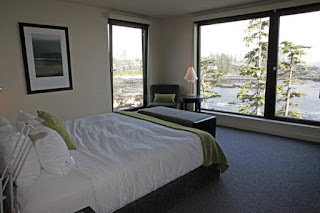 Of course, it helped that our accommodations were absolutely gorgeous at the Black Rock Oceanfront Resort, perfectly situated on a rugged rocky promontory surrounded by expansive ocean, rocky inlet, and lush forest. The lobby entrance is perhaps the most dramatic and tasteful architecture I have ever seen, beautifully bringing the outside in. And the views from the rooms are equally and unquestionably spectacular. We took a stroll down the road at dusk on the evening of our arrival. We were told to "make yourselves heard" so as not to startle any bears that might be wandering around. My 7-year-old daughter clung to my legs and begged my husband to carry her. I took this opportunity to teach her the camp song "The other day...I met a bear..." and soon her fear turned to courage. We sang and laughed and laughed and sang, and skipped gleefully down the road. We must have been sufficiently loud, as no bears crossed our path; and we only quieted enough to watch a doe and her fawn foraging on the roadside ahead of us. The peace of the forest contrasted nicely with the roar of the ocean. That first night - falling asleep listening to the rising tide and the waves crashing into the rocky shore all around - is something I won't put into words, it simply must be experienced. It doesn't take a trip into Pacific Rim National Park boundaries to sight the wildlife, it's everywhere. In fact, most of our wildlife sightings occurred roadside or just around town...or even just from our balcony at Black Rock. Bald Eagles are most abundant, with pairs nesting in the treetops and fishing in the waters, or simply soaring in the fresh cool ocean air. And speaking of ocean, the marine life is pretty incredible. While much can be viewed from shore, we opted for an afternoon out on a cruise to explore the Broken Group Islands unit of the park. Whales are a given, especially with resident Humpbacks in the area. Harbor Seals are often spotted. Stellar Sea Lions are easily seen...and heard. But the elusive Sea Otter is not so cooperative for most visitors. We got lucky. That's not to say there isn't anything to find if you don't have sea legs. 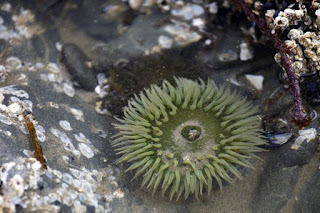 The beaches offer plenty of tidepool creatures, for a touchy feely encounter. The park boasts several beaches, including one really long one appropriately referred to as"Long Beach". 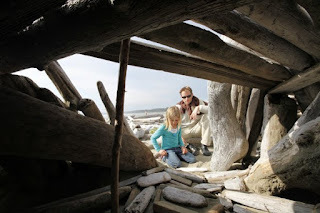 Between exploring tidepools, surfing, and building forts of driftwood, one can easily pass the day away at the beach. We did just that, and found a great spot for a scenic lunch (or dinner) at the Wickaninish Restaurant. They offer a nice selection of vegetarian entrees and kid's menu as well - a welcome change (and the only disappointment) from our resort. 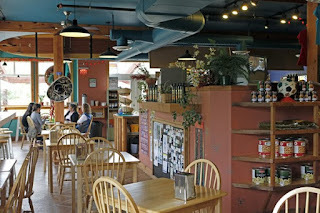 But our favorite foodie find was right in town in Ucluelet, this little local's spot hit the spot every time with healthy, yummy, tasty homemade food. Delicado's has something for everyone, and if you're a surfer, or a lover of southwestern flavors, don't even think of looking further! The owner and crew are totally cool, and the decor is fun, too. Time both flew and stood still. Days passed with no set agenda and spontaneous adventures. Nights passed being lulled to sleep by the sound of the ocean. And then, it was time to leave. Remember that horrendous drive I mentioned earning a spot on my "never again" list? Well, since we had not opted to fly in and out of Tofino, we had a rental car which had to get back to Victoria, and tickets on a plane which had to leave Victoria that same day. All of that meant a very early morning departure to hit the road. Our time was too short. We'd seen alot, experienced a dose of both adventure and serenity found nowhere else on the planet, and captured plenty of wildlife with a lens. Everything but the bear - the Black Bear - for which we booked a cruise and scanned the shores and hoped to spot on our guided wildlife outings. Nope. Of course, it's not until the bags are packed with miles to cross and a flight to catch that the elusive black bear presented itself. Right smack on the side of the road, who would have thought, drive-by wildlife viewing free of charge?! So much for the "never again" list entry - had we flown into and out of Tofino, we'd never have seen a bear. So that 5-6-hour-totally-stressful-but-scenic-harrowing-road-drive from Victoria to Ucluelet.....now, TOTALLY WORTH IT. (I still think I'll fly next time). incredible visit, kymri! i think we need to go there. WOW!! lovely, lovely photos! No wonder my husband has been pushing for Vancouver - there is a secret surf spot there! Thanks for the coverage on this beautiful place, it certainly looks like a destination that has it all. I'd love to visit B.C., and I know I'd really love falling asleep to the sound of the waves! I got pretty lucky in 2006 when my agency sent me to Ucluelet for a photoshoot :) Although it was only for 1 day but i did get to explore Ucluelet and I visited Pacific Rim National Park. What a great entry—Ucluelet is certainly beautiful, and despite living in Canada — I've only spent a day in the area. 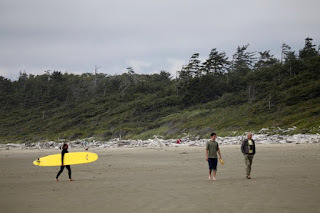 Lorraine—if your husband likes to surf, you should check out Tofino—also in the area! This looks like a beautiful spot. What time of year is best to visit? I love the photos. It looks delicious. Thanks for sharing.